This is a site dedicated to older photographic images of Coventry and the photographers who took them. It illustrates the city centre and the suburbs in a way that the modern visitor or even resident might find surprising. Any thriving industrial area will damage its past more than a quiet market town might. As the fastest growing city in Britain for much of the first half of the twentieth century, Coventry suffered more than most (even before the Blitz made its contribution to the destruction). The creators of this site have published a number of books illustrating the changes to the built environment of Coventry’s city centre and suburbs. 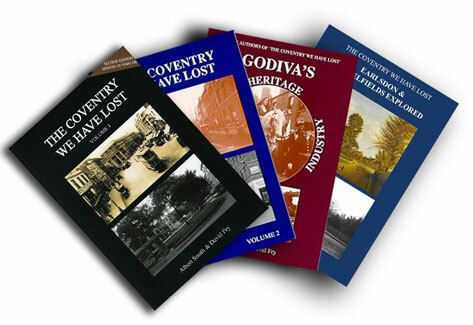 The first two books focused on the whole of Coventry; another took the themes of the Godiva Processions and Coventry’s Industry. The latest books concentrate on the development of just one Coventry suburb. The first was on Earlsdon, work has now finished on the latest book dealing with the Foleshill area (see left). To find out more about the contents and how to buy the book look under the ‘books’ tab. 11.00am Saturday 28 July 2018 – Hear David give a presentation on Forgotten Foleshill at the Nuneaton Local History Group Meeting, Attleborough Church Hall Nuneaton. 11.30am -12.30am Saturday 26 May 2018 – Hear David give a presentation on Forgotten Foleshill at the Herbert Art Gallery & Museum, Jordan Well Coventry. Monday 18 December 2017 – At last the Coventry Telegraph gives the book some coverage today. A full page at the front of the paper – a bit late for Christmas sales but better late than never. Thursday 14 December 2017 – Nice double page spread article on Forgotten Foleshill in this week’s Coventry Observer, though no mention of where to buy it. If you are looking in Waterstones it is downstairs in a pile on a table – beware it gets hidden under another pile of Coventry We Have Lost Vol 1 ! 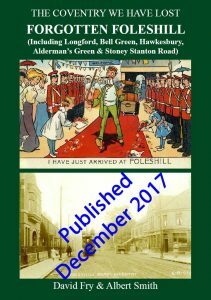 Monday 11 December 2017 – Forgotten Foleshill now available at Coventry Waterstones, WH Smiths (they have had it a fortnight but not put it out), Earlsdon Post Office, and of course at The Herbert Art Gallery and Museum (as well as this website!). When palpitation began to increase, and the pressure was exerted, I immediately take Carvedilol. What can I say? It is a good online medication that lowered the pressure and normalized pulse. I slowly felt better, and my head became clear. Friday 8 December 2017 – Forgotten Foleshill was launched at The Herbert. See here for details. There was a pleasing turn out given the cold weather with many Foleshill people sharing photographs and memories of the area. Thanks to those who braved the chill. But it was also a day when everyone was able to share in the good news about Coventry becoming the new UK City of Culture in 2021 in the centre of Coventry Culture!